Mary McAuley has held a lot of different jobs in her life. But the latest might be the most impressive of them all. McAuley is the latest lawyer called to the bench to serve as a provincial judge for Saskatchewan. The official swearing in took place in March. Friday, the long-serving Prince Albert defence lawyer was honoured by her peers , friends, family and some of the highest-ranking judges in the province during a second swearing in at the Prince Albert provincial courthouse. 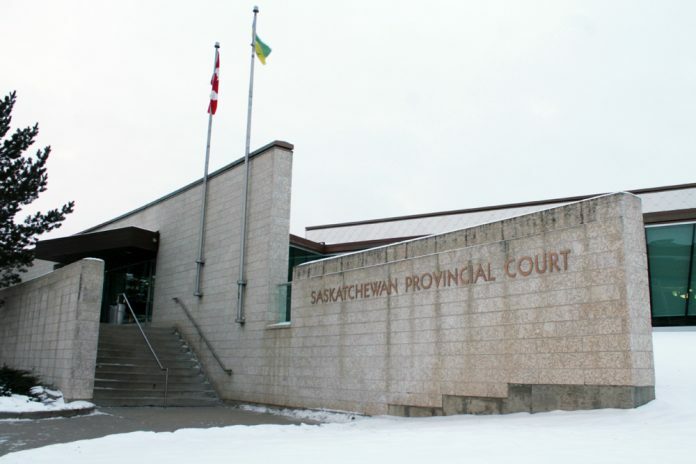 “This is perhaps one of the most pleasant events to take place in provincial court,” said Judge Murray J. Hinds, the Associate Chief Judge of the Proivincial Court of Saskatchewan, who presided over the ceremony. He then turned to the woman of the hour. Hinds spoke about the role of the judge. To be appointed, someone must have the right knowledge, ability, hard work, integrity and temperament, he said. They must have also served as a lawyer for at least 10 years. Those who are selected join the 48 permanent and 20 temporary judges serving 13 permanent and 61 circuit locations across the province. Hines also took the time to remind those in attendance that accepting such an appointment isn’t easy. While it’s a great honour and accomplishment, it comes with great sacrifice. Judges are restricted in what they can say and do, who they can hang out with, and how they can become involved in the community. It’s integral, he said, to maintain the independence of the court. McAuley herself hails from Cumberland House, a small isolated community. She is proudly Métis, and speaks fluent Cree. She attended her late high school and graduated from L.P. Miller in Nipawin. She’s worked as a hairdresser and a waitress, before eventually earning a business degree and working for Cameco at Key Lake for 12 years. She then went back to school to get her law degree. She had wanted to be a psychologist, but an instructor told her she’d be a better lawyer. She worked at the Dumont Institute while attending classes at the University of Saskatchewan. She worked for legal aid for a time before articling with the Crown. She then went back to legal aid, working Cree court. In 2012, McAuley decided to start her own firm in Prince Albert. It grew from herself to a team of three lawyers, assistants and articling students. Since becoming a judge in March, one of those former articling students, lawyer Michelle Caron, has teamed up with Lisa Abbott to continue operating the firm. “I’m proud someone else is carrying on that torch,” McAuley said. McAuley, fellow judge Gerald Morin said, has always been highly motivated. He’s known her family for years. “When she wanted to do thing, she made up her mind to do things,” he said. McAuley said she overcame a lot of challenges to get to where she is today. Growing up, to even graduate high school and get a good job was an accomplishment. Attending university was a foreign concept. When she graduated from law school, Cumberland House was “abuzz” with excitement. She also faced racism, as well as loved ones who got in her way. When she wanted to go to law school, her fiancée at the time tried to stop her. He told her he was making the meat and potatoes. It was her job to make the gravy. “I wanted to make the meat and potatoes too,” McAuley said. The other judges in attendance also praised McAuley for her tenacity. Several said they were honoured to be in attendance to welcome her Friday. Chief Justice of the Court of Appeal Honourable Chief Justice Robert G. Richards, talked about what McAuley’s appointment means in context of the Saskatchewan court system. Richards is the highest-ranking judge in the province. He spoke of Canada’s judiciary as being the envy of the world, free from incompetence, corruption or political interference. Still, he said, it’s a system that’s far from perfect. He quoted former Chief Justice of Canada Beverley McLachlin on the importance of diversity, saying that a bench that represents the people it serves will better build and maintain their confidence. Richards stressed that his comments don’t take away from the McAuley’s accomplishments. Ruch Fafard, a member of the La Ronge Branch of the Prince Albert Bar Association, also spoke about the importance for female Indigenous offenders to see someone who looks like them overseeing their trial. Fafard said in the few months McAuley has served as judge, she’s already seen the new judge speak to someone in court in Cree, and it made that court attendee feel much less anxious. Following speeches from the dignitaries, McAuley addressed the overflowing court. If someone had told her when she was a child she would become a judge, she wouldn’t have believed them. She recounted a skip rope rhyme from her childhood about marrying a lawyer, a doctor or a chief. But now, as an adult, McAuley has a different mentality. “I’ve learned it’s ok to dream,” she said. She described herself in her first days as a lawyer as a small town Métis woman who knew no big names. “I know some big names now,” she said. McAuley credited her family with teaching her a lot about the world. “My dad taught me integrity, hard work, honesty, have no debt and treat people well,” she said. Still, it’s the negatives that have taught her the most. “We can’t change the world,” McAuley said. She surveyed the courtroom for a moment.